For Christmas, I would like for someone to give me a t-shirt that says “As a matter of fact I am not a $#@!ing tourist, I live here!” - but my daughter Blondie says that would be rather too hostile. And what brought that on? Oh, just the experience of going downtown at midweek, and having completed the necessary errand early, deciding to prowl the little art galleries and shops in La Villita, instead. La Villita is a collection of very old houses, very nearly the oldest in San Antonio, most of which were restored over the last thirty or forty years or so; electricity and plumbing being added to them with considerable difficulty. A good few have very low doorways, and very thick walls, and once were heated (if at all) with tiny fireplaces. 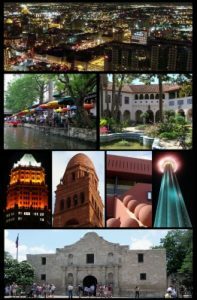 The neighborhood is adjacent to the River Walk, and the Alamo - even if the shops and galleries offer merchandise a couple of cuts above the usual tourist tat, it remains that nearly everyone wandering through is in fact most usually…from out of town! And since there weren’t many people wandering around, most of the vendors were a little bored and very friendly, well disposed to be helpful; really this part of the world is a very friendly place. If you are antisocial, you’d have to beat them off with a stick, but about the first thing anyone asked was So, where are you folks from? I just got tired of growling From here! Hence, the wish for the tee-shirt. Blondie bought a silver and garnet ring from a small jewelry and art gallery, and admired a bronze cat statuette, one of an issue of fifty, by an artist who lives in Kerrville; she might very well go back and buy it next month. I fell in love with some paintings by another local artist, who does lovely impressionist Texas landscapes: great sweeps of meadow, or gently rolling hills - but above them the even bigger clouds, piling up in a clear blue sky. It looked like what I have seen out of the car windows on various road-trips towards the coast, so there was no surprise when the gallery manager said the artist lives in Victoria and paints the countryside thereabouts. Oh, yeah - when I’m a rich and famous writer, I want a couple of those! Since I couldn’t afford anything, I derived amusement out of describing my ideal piece of Texas kitsch art: a huge painting of a field of bluebonnets, with some longhorn cows, standing knee-deep in them. In the background sits a windmill, and a tumbledown old barn with the Texas lone-star flag painted on the roof, and the clouds in the sky form the silhouette of the Alamo! Maybe even on black velvet, too! I’d have it somewhere where I could see people’s faces when they looked at it, and know that if they looked absolutely horrified, then they did know something about art. 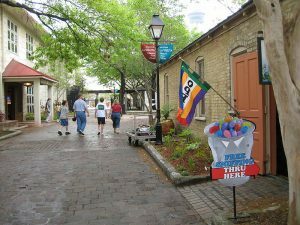 Alas, irony was taking a vacation somewhere away from La Villita; most of the people I described this vision to said that it sounded rather nice - Did I want to commission an artist, since all they had in stock along that line were painting of bluebonnets only. Fall is here, it’s deliciously cool and the clouds are piling up – and some day, with luck, I’ll walk into that one gallery and buy one of the landscape cloud paintings.